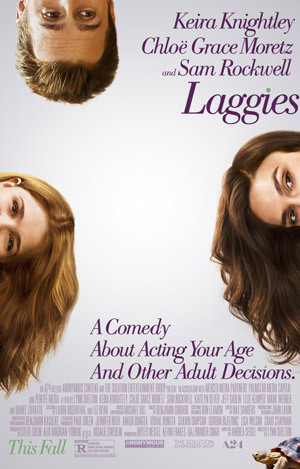 Keira Knightley, Chloë Grace Moretz and Sam Rockwell star in the comedy drama Laggies. Check out the movie trailer below. A 28-year-old woman (Knightley) reacts to her boyfriend’s marriage proposal by pretending to go on a business retreat but she actually hangs out with a new 16-year old friend (Moretz). MPAA Rating: (R) for language, some sexual material and teen partying. Having spent her twenties comfortably inert, 28-year-old Megan (Keira Knightley) reaches a crisis when she finds herself squarely in adulthood with no career prospects, no particular motivation to pursue any and no one to relate to, including her high school boyfriend (Mark Webber). When he proposes, Megan panics and given an opportunity to escape – at least temporarily – she hides out in the home of her new friend, 16-year-old Annika (Chloë Grace Moretz) and Annika’s world-weary single dad (Sam Rockwell).